In the 17th version of the Harper Cup, No. 12 UC San Diego took down No. 21 San Diego State University, 6–5, to take the annual cup between the two sides. With a healthy attendance of 1,003 at the Canyonview Aquatic Center, the Tritons faithful made their voices heard on the evening. A tight match throughout, UCSD found a way to overcome the SDSU attack. The Tritons had a strong start to the game as freshman attacker Grace Pevehouse put in the opening goal in the first two minutes of play. From that point on, both teams struggled to get a goal as Pevehouse’s goal was the lone goal in the first quarter. UCSD seemed to have a grip on the game as it led by the one goal, but also looked strong defensively, not allowing many opportunities for SDSU. However, the momentum shifted in the second quarter as a pair of mistakes from the Tritons put them behind in the match in a matter of minutes, 2–1. Going into the half with goals at a premium, it seemed that the next goal from either side would be a crucial one. The match was a tale of two halves in terms of the style of play — the first half was a defensive battle, but in the second it was back and forth action to the end. The Aztecs were able to get a third goal in the last minutes of the third quarter to create a bit of separation; However the Tritons had other plans as they answered back less than a minute later to close the gap, 3–2. Then, with only 30 seconds remaining, the Tritons put another goal in to go into the fourth with all the momentum with the score even at 3–3. UCSD carried their momentum into the fourth, crucially getting the first goal of the fourth to earn their first lead since the opening quarter. However, the lead did not last long, as on the next possession, the Aztecs got the goal back to level the match at 4–4. Once again, only a few minutes later, UCSD would go on to score. However, SDSU would come back and respond to keep the sides even. With only two minutes remaining, the score stood at 5–5. Junior attacker Shelby Stender, the hero for the Tritons, put in the game-winning goal with only 1:38 left to play. This time, the Aztecs could not gasp one more goal. With the win, the Tritons improved to 21–11 overall, making it their third-straight Harper Cup victory. 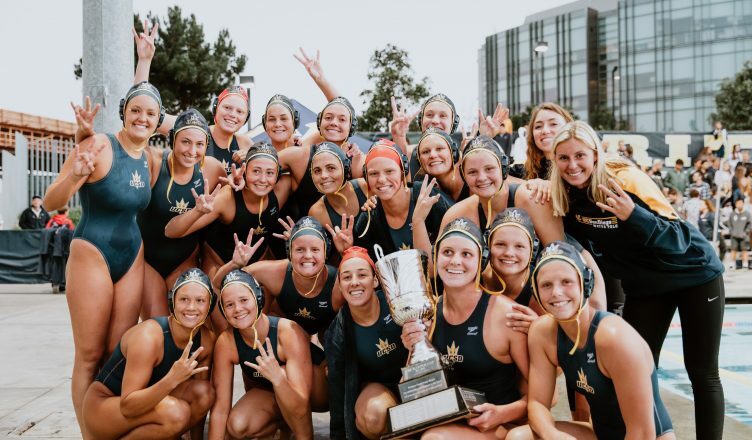 Next up for the Tritons is the Western Water Polo Association Championship, which will be held at the Canyonview Aquatic Center starting on Friday, April 27.